Never miss an opportunity to add more flavor to your lentils -- they can take a LOT. There are so many different types of lentils -- not just green ones you see all the time! There are the beautiful, glistening black beluga lentils that are great in soups and as a side dish, de Puy lentils that are firm, rich, and perfect for salads, red lentils that become creamy and salmony pink and are best cooked into Indian-spiced stews. And guess what? They don't all cook the same way -- but we'll get to that in a second. 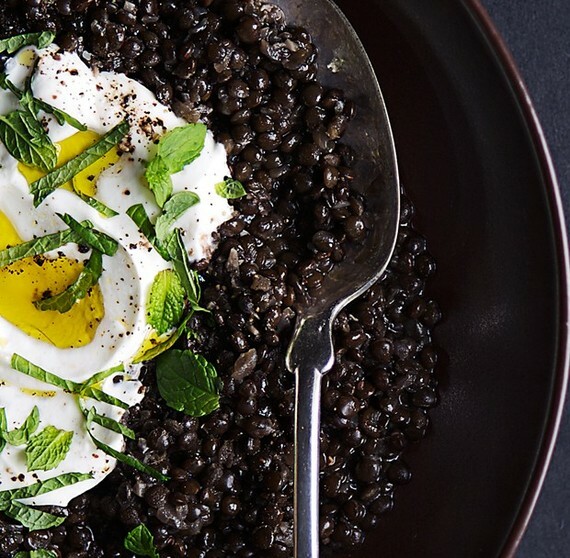 You're probably not going to find a pebble in your lentils -- but it's worth a quick look. The one time our writer Rochelle Bilow decided not to pick through her lentils for an unwanted intruder, her friend cracked her tooth on a rogue rock. You could pick through five pounds of lentils and not find a stone -- but it's worth the insurance. Lentils aren't rice -- they don't need to absorb every last drop of cooking liquid. They're more like pasta: best cooked in an abundance of water or stock. Bring your liquid up to a boil, add your lentils, then turn down your heat to a simmer for at least 25-30 minutes. Keep tasting your lentils as they cook to see if they're the consistency you want -- more firm if you're eating them on their own or in a salad, and softer if they're going into a soup or stew. Never miss an opportunity to add more flavor to your lentils -- they can take a LOT. Add a halved onion to your water/stock. Or crushed garlic. Or a bundle of herbs. And never forget: Salt your water. If you're going to serve them on their own as a side, make sure you give them a dressing. A little red wine vinegar and extra-virgin olive oil goes a long way -- and an armful of butter and a ton of Indian spices goes a lot further. Don't underestimate these little legumes: Those babies can take all the butter and seasoning you can throw at them.